The book gives a simple explanation to, and history of, Einstein’s theory. Many errors in the interpretations of the basic phenomena are explained. An alternative theory is presented. The wave model explains light and the particle model explains gravity. The wave or particle confusion is solved. 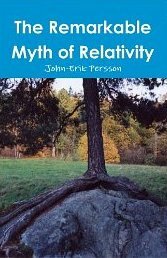 This book demonstrates that many of the physical phenomena behind Einstein’s theory have alternative interpretations. New ideas regarding light and old ideas regarding ether indicate a way out of the wave or particle confusion and allow absolute space and absolute, universal time.